Gamescom 2018: Amazon reveals The Grand Tour Game for PlayStation 4 and Xbox One. 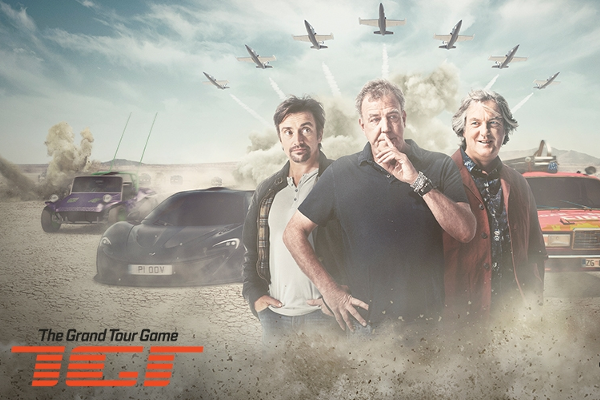 Amazon today announced that The Grand Tour Game, an episodic racing game based on the hit Prime Original series, is coming to PlayStation 4 and Xbox One. This upcoming episodic game lets players race exotic cars, recreate wild challenges, and join in Clarkson, Hammond, and May's shenanigans. The Grand Tour Game transports players to exotic locations, where they'll drive the world's most interesting cars, and participate in the show's outrageous challenges. New episodes of The Grand Tour Game will be added weekly during Season 3 of the show, capturing cars, locations, and surprises from each week's episode. In The Grand Tour Game, players can not only follow in the guys' tire tracks, but race and challenge each other face-to-face. The Grand Tour Game features four-player splitscreen, so players can race against each other-and hurl their best insults-in-person. Cheeky power-ups like High Tea, which spills tire-shredding cups and saucers, and More Horsepowers, which lets you blow past the competition, help make the action unpredictable, and keep racers on their toes. The Grand Tour Game was created by Amazon Game Studios, Seattle. The game was built using Amazon Game Tech, including Amazon Web Services (AWS) and Amazon Lumberyard. The Grand Tour is a Prime Original for Prime Video. The Executive Producer is Andy Wilman.